My name is Mooch. I don’t normally eat things that are not mine. Yesterday I ate a friend’s hearing aid. Now he has to go to work without it and my parents have to pay to replace it. That was one expensive chew toy. My dog did that with my dads!! I think he left it on and the sound attracted her!! The high-pitched screech drives dogs crazy. My grandma’s dog did the same thing to her. What breed is Mooch? He looks just like my rescue Mr. Bunny. I work with hearing aids at an ENT office. We warn people allllll the time on how much dogs LOVE hearing aids. Cats too! I have had people actually bring them in for repairs after it went out the other end of the dog- they have been repaired and these people will wear them in their ears again! They are not a cheap chew toy at all! Also- this dog looks exactly like mine! I got such a kick out of this post! The better to hear you with my dear…..
That is one sad looking Mooch. That’s not an ashamed look, that’s the look of a tummy ache. 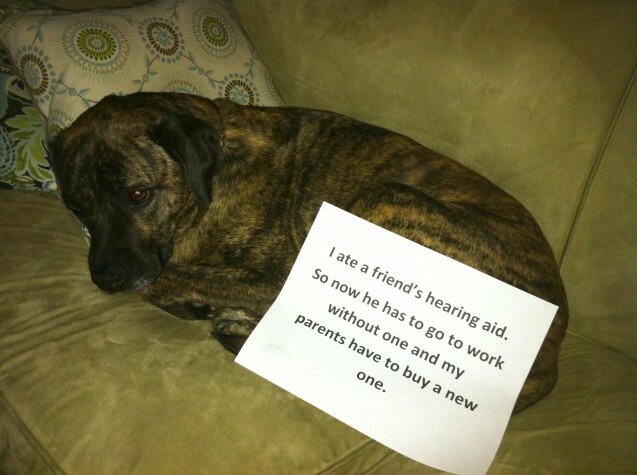 Yeah, be forewarned dog owners, today’s hearing aids typically cost $2,000+… per ear! They can be less, but they can be more as well. It’s not just the sound, it’s that deep human smell dogs love. My mom’s cost $1300 and she lost them at her assisted living! Before you pay, have the friend check to see if they had insurance. Someone should have kept it in his ear, right Mooch!! My dog ate my hearing aid once! Something about the taste of earwax….yum? This wouldn’t have happened if your houseguest had been wearing otoclips. After I lost my first aid, I bought half a dozen of these, and I haven’t lost an aid since. They come in clear or funky colors, so you can wear them discreetly or with intention, whatever suits. See Westone online for them, and, no, I’m no affiliated with Westone, just very relieved to have a solution for this problem that was making me reluctant to wear mine. Thanks for posting that tip on the “Otoclip” am going to pass the info along to my mom! See, poor misunderstood (lol) Mooch actually ended up helping someone out despite his being in the doghouse!! My dog is obsessed with earwax. She never eats garbage but she will root through the bathroom trashcan Every. Single. Day. and steal the q-tips. Nothing else.